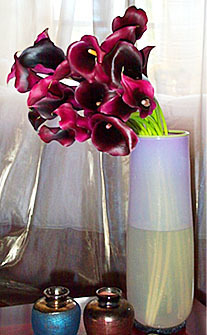 Without a doubt, the most beautiful and rare miniature calla lilies are the Ryvale of New Zealand. 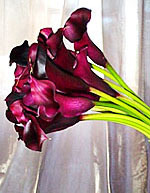 Their clean, burgundy-black petals have a soft leathery texture that is truly exquisite. If you have not yet experienced this luscious flower, it's time for you bring the beauty of New Zealand into your home. Each flower measures approximately 3 inches in length with a 17-inch stem. With proper care, the flowers last for up to 6-8 weeks. Imported. 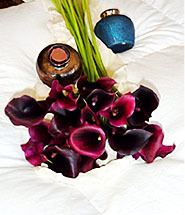 The arrangement above was created with 20 stems of freshly cut Black Calla Lily in Isabella's Artisan vase. Each purchase includes care instructions and an exquisite gift card for your personal message.